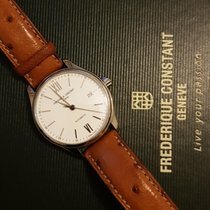 Frédérique Constant is a rising star in the Swiss watch scene. The Genevan company represents affordable luxury like no other manufacturer; they offer affordably-priced watches with complications such as a perpetual calendar or tourbillion. The couple Aletta Stas-Bax and Peter Stas founded Frédérique Constant in 1988. The company is named after two of their ancestors: Frederique Schreiner and Constant Stas. Four years after the Geneva-based company was founded, they presented their first six watch models. A local watchmaker assembled the watches and used Swiss movements . Today, the company is known for their depth of production. They feature calibers developed in-house with complications such as a perpetual calendar, tourbillon, or flyback chronograph, all at fair prices. Frédérique Constant keeps things modern; their Horological Smartwatch is evidence of this. The watch is unique: It's a smartwatch with a classic analog display that connects to your smartphone via Bluetooth. This makes manually setting your watch a thing of the past. Furthermore, the Horological Smartwatch has a range of diverse functions, such as an activity tracker , sleep monitor , smart alarm, world time function, and the so-called Dynamic Coach. Frédérique Constant's E-Strap, a strap with an integrated smartwatch module, offers the same features. Using the E-Strap, you can turn any mechanical watch into a smartwatch. The leather strap is attached to the watch case like any regular strap. Which are popular models and how much do they cost? Frédérique Constant has numerous men's and women's watches available. Their product portfolio includes everything from the super-thin Slimline models to women's diamond-studded watches, as well as the intricate watches in the Manufacture collection. 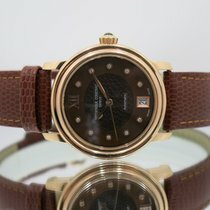 Lovers of dress watches will certainly find something suited to their tastes amongst the Genevan manufacturer's watches. Fans of chronographs, as well as women desiring an elegant watch, will get their money's worth. You can not only find simple three-hand dress watches in the Manufacture collection, but also the most intricate Frédérique Constant watches. These complicated watches show off Frédérique Constant's incredible watchmaking skills. The calibers used in this collection were developed by the manufacturer themselves. Most of the movements are based on the 2009 caliber FC-700, which is produced en masse and can be easily modified. The Slimline Perpetual Calendar is one of the most affordable luxury watches featuring a perpetual calendar. Its movement, the FC-775, is based on the caliber FC-700. You can purchase a new, stainless steel version of this watch starting at 6,200 euros. This price is comparatively inexpensive; a new Patek Philippe Perpetual Calendar, will cost you at least 45,000 euros. The Frédérique Constant Slimline Perpetual Calendar is available in two versions. One is a more classic timepiece with Roman numerals, a guilloche dial, and Breguet hands. The other version is simpler with thin indices. The case is made of stainless steel or 18-karat rose gold. A rose gold model will cost you around 15,000 euros. If you're a fan of the golden color, but don't need 18-karat, then the 8,000 euro gold-plated alternative is a good idea. The Worldtimer is another highlight of the Manufacture collection. With a world time function, it's the perfect wristwatch for business people and anyone who wants to keep an eye on multiple time zones at once. There's a rotatable ring with the names of 24 cities on the edge of the dial. Every city represents a time zone. Thanks to the 24-hour ring, you only need to glance at the watch to tell the time in different parts of the world. The hour, minute, and second hands tell the local time. This timepiece is powered by the caliber FC-718. You have the choice between a stainless steel and gold-plated version with either a more classic or modern dial. The modern dial features a world map in the middle. 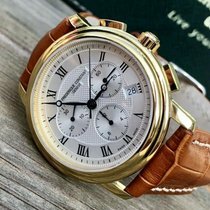 The classic version features Roman numerals, guilloche, and Breguet hands. The timepiece comes with either a leather strap or stainless steel bracelet. Prices for a new Worldtimer watch start at 2,100 euros; gold-plated versions cost around 2,700 euros. Frédérique Constant presented their first in-house developed flyback chronograph in 2017. The wristwatch with a timer function is made of stainless steel, although there are also gold-plated versions for lovers of gold watches. The major highlight of this chronograph is its caliber, FC-760. Thanks to its flyback mechanism, you can reset the stopwatch hand to zero while it's running by pushing one of the push-pieces only once. Normally, you have to first stop the timer, reset to zero, and then start again, each time pressing a push-piece. There are only a few in-house calibers with a flyback function. 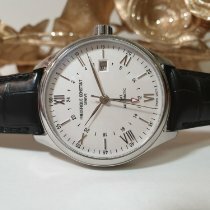 One example is the caliber 89361 from the International Watch Company (IWC). This movement powers the Portugieser Yacht Club Chronograph, which costs 8,000 euros new. 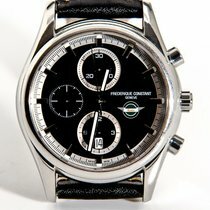 In comparison, the Flyback Chronograph Manufacture by Frédérique Constant is very affordable; it only costs 3,700 euros. The Manufacture Slimline Moonphase is an especially thin watch at only 11.3 mm thick. Thanks to its size, it fits discreetly under every shirt cuff, making it the ideal dress watch. The timepiece has a simple yet elegant design. It has a clean dial with thin indices; the hour and minute hands also have a delicate look about them. The moon phase display and date hand are located at six o'clock. The case is made of stainless steel or 18-karat rose gold. The ladies' Slimline Moonphase timepieces have diamond-set bezels and diamonds as indices. Frédérique Constant most often uses alligator leather for their straps. Seven-link stainless steel bracelets are also available for men's watches. The Manufacture Slimline Moonphase is available new for around 1,900 euros. Gold-plated models cost around 2,500 euros. Versions made of 18-karat rose gold cost significantly more at 8,000 euros. Prices for new women's watches set with diamonds start at 3,800 euros. Frédérique Constant's Horological Smartwatch is the ideal wristwatch for the 21st century. Although you can't tell at first glance, it's packed to the brim with the most modern technology. This smartwatch can track your activities, monitor your sleep, wake you gently in the morning, and remind you to be more active during the day. The NOTIFY models also send you notifications when you receive a new email or get a call. Thanks to the world time function, the smartwatch automatically displays the current local time, no matter where you are. The watch has a classic, elegant design. You can connect the watch to your smartphone (iOS and Android) via Bluetooth. The Frédérique Constant Smartwatch is available for women and men. The look of the women's watch is more feminine and elegant, and some versions feature diamond-set dials. Prices for a new women's smartwatch start at 700 euros. New men's models cost about the same. Versions with a gold-plated case cost around 1,250 euros. The Classics collection is, as its name suggests, full of classic designs. Roman numerals, Breguet or feuille hands, and guilloche dials define the look of these timepieces. One of the most popular models is the Classics Index, a simple three-hand watch with a date display at three o'clock. The stainless steel watch is also available as a gold-plated or bicolor version. You have the choice of a brown or black leather strap or a five or three-link stainless steel bracelet. The dial comes in black or white, and thin indices or Roman numerals paired with indices serve as hour markers. The caliber FC-303 powers these timepieces and features a 38-hour power reserve. The automatic movement is based on the SW200-1 by Sellita. You can purchase a new Classic Index for around 700 euros. There are also more practical watches in the Classics series. The Index GMT, for example, features a second hour hand. Together with the 24-hour scale on the watch, the time in a second time zone is displayed. You should be prepared to spend around 1,300 euros on this GMT watch. If you want to use your watch as a timer, then you should consider the Classics Chronograph. This timepiece comes in a gold-plated and a stainless steel version. The white dial has a guilloche pattern in the middle and Roman numerals as hour markers. Frédérique Constant uses Breguet hands for displaying the time. The quartz movement FC-292 powers this chronograph, and there's a date display at four o'clock. You can expect to spend around 650 euros on this Frédérique Constant watch. Frédérique Constant has countless women's watches to offer. Most are adorned with sparkling diamonds on the dial. If that leaves you wanting more, however, you can find models with diamonds all over the bezel and dial. The World Heart Federation models are particularly lovingly crafted. The timepieces have two heart-shaped cut outs in the dial at 12 o'clock, giving you a look at the inner workings of the watch. The gold-plated stainless steel cases emphasize the feminine character of these timepieces. Like the Heart Beat watches, which have a circular cut out in the dial, the World Heart Federation watches are part of the Ladies Automatic collection. You can buy a new diamond-set timepiece from this series for only 1,500 euros. The Classics Delight collection is the second women's series by Frédérique Constant. Most watches in this series have a very feminine design; rounded bracelet links and small lugs emphasize the softer look. Above all, the bicolor versions with gold-plated bezels and bracelet middle links make perfect jewelry for your wrist. Diamond indices adorn many versions as well, increasing their value. The design of the round Delight watches is reminiscent of the Ebel Beluga. The Ebel timepiece costs around 1,500 euros new with a quartz movement; a new Classics Delight only costs around 1,400 euros with an automatic movement.